Welcome to The Abso!ute Sound online! We explore music and the reproduction of music in the home. We believe that the sound of music, unamplified, occurring in a real space is a philosophic absolute against which we may judge the performance of devices designed to reproduce music. Our goal is to provide the resources consumers need to judge how a component's sound either honors or departs from the music's truth, and to make sound purchasing decisions that maximize their experience of reproduced sound. 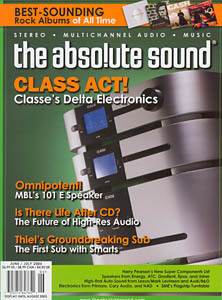 Below is our Issue 154, June/July 2005 table of contents and editorial. In this new column, Chris Martens explores affordable multichannel sound. Tom Martin and Alan Taffel hit the road with two sophisticated auto sound systems. Modern features, classic sound, and great looks — Neil Gader reports on Classé’s latest. Where do SACD and DVD-Audio stand? What’s next after CD? Ted Cohen of EMI Music, David Kawakami of Sony’s SACD Project, and Bob Stuart of Meridian Audio, share their insights. Robert Harley and Harry Pearson moderate. Paul Seydor on SME’s tippy-top model. A no-fuss, no-muss, no-brainer, says Jeff Dorgay. Though it’s not ruler-flat, Neil Gader finds many virtues in Veritas. Robert E. Greene on an unusual and effective design. Wayne Garcia listens to Cary’s moderately priced separates. A pro audio firm goes domestic. Neil Gader reports. Chris Martens on an ambitious Taiwanese design; Robert Harley comments. Third time’s the charm, says a smitten Jonathan Valin. Alan Taffel takes a long listen to Thiel’s innovative subwoofer and crossover. Musings on the state of the art, further thoughts on reference gear, an updated Super Components list, and a word on Classic’s 200-gram Quiex pressings. Bob Gendron and Wayne Garcia sift through their collections in search of the great-sounding rock records. Coverage of eleven discs and one essential LP set, including offerings from The Harp Consort, Christopher O’Riley, Anu Tali, and two classics on JVC XRCD. Reviews of 14 new CDs, including the latest from The National, Spoon, Mars Volta, Bloc Party, Moby, and Al Green, plus six fresh LPs tackled in our Hot Wax subsection. At it again — Bob Gendron and Wayne Garcia on some truly awful rock album covers.